In part one of this interview with Mitch Carley, creator of Duggy "The Smile in the Sky", Carley explained how the sketches of a 12-year-old kid in Ohio can come to life. The way Duggy came alive and moved from a sheet of paper to an air show near you is an absolute perfect example of the power of this great airplane. Here, in part two, we let Carley explain how Duggy has helped to launch the dreams of countless kids, and a few adults too, including myself. World of Flying: Can a paint job and a big smile on the nose really change an airplane's personality? Describe the transformation from the old DC-3 to Duggy. Were you there as they painted him, and if yes, describe your personal elation. Mitch Carley: I believe it 'released him' if you will. This airframe (N1XP) has rich history and I really believe it was his destiny. Robert [Odergaard] said this airframe ALWAYS flew the 'happiest'. 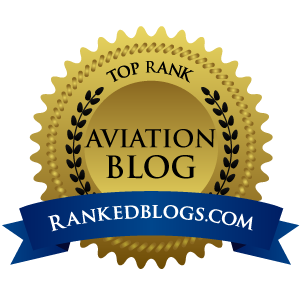 Several other experts on warbirds that have flown N1XP, all agree. So, my answer is yes. In the air it validates this airframe's love for flying and on the ground – with kids – there is nothing like it, I will not even try to describe it here. I was in Goderich, Canada at SkyHarbor where and when Duggy was painted. The feeling is best described as seeing a birth…honestly. Unreal! 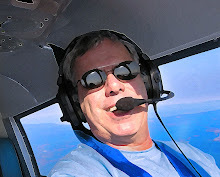 World of Flying: Tell my readers intimate details about some of Duggy's personality traits that will surprise them, and give examples of anything supernatural or weird that has happened inside or around Duggy. MC: This plane brings out the best in people and also brings out their dreams. We have arrived in the morning to move Duggy and found child's drawings and notes left for us and or Duggy…just like they do with Santa…very heartwarming. We have found child's vitamins under his tires in the morning – to later find out that children have forgone chewing their vitamins in exchange for giving them to Duggy. One boy in particular walks the family back every night at Oshkosh to say some words to Duggy for a good night's sleep. Another girl who did not want to leave Duggy and was crying broke from her fathers grip to run back and hug his tire. Robert has said Duggy has leapt into the air from time to time as if he is jumping off the runway…again, unreal. World of Flying: Why do you say Duggy is the luckiest airframe in the world? MC: I often say that because, going from a cold auction block of a few DC-3's in Canada to the sunny state of Florida with kids loving him as they visit him…it is absolutely a blessed and in turn 'lucky' airplane. You have to join us at an air show and experience it, the way the kids react to him…it is truly hard to describe. 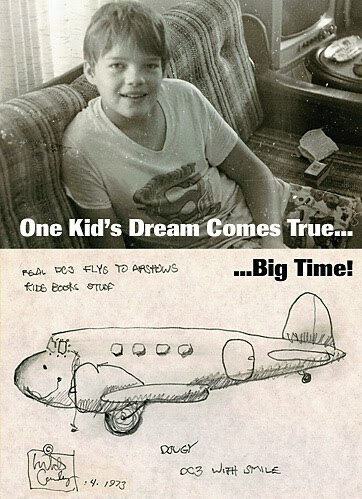 World of Flying: The mission of Duggy is to help make kids' dreams come true. Are these just aviation dreams, or dreams as a whole? Explain how this whole concept has been received by children across the USA. MC: Dreams of any kind. I personally was a child that often tried out new things, hobbies, sports, outdoor adventures…really trying to find the next thing that made my mind happy. As I moved through school I had one great councilor and the others seemed invisible. I learned the value of finding a Dream, finding a Team and working it when I addressed a US Air Force recruiting Officer in high school. I discussed the fact that I was interested in flying a C-130 in the Air Force. He asked how my math grades were…they were bad. In fact I had nowhere near the schooling I needed to achieve that dream – it was too late. I have carried that 'chip' for years and with the introduction of the often 'bad' internet I realized – hey – Dream It, Team It, Work it…so we added a great search engine powered by ASK for Kids! on Duggy.com that is safe way to help kids find their dreams. Kids of all ages, incomes, languages and so on…anywhere in the world. World of Flying: In your wildest dreams, what would be the ultimate success story for Duggy and the entire Duggy Dream Team project in the future? MC: This world's success stories are so often fueled by media. So, I dream of the day that the media fuels Duggy's mission. TV Show, website, news, in-school teaching, home-school teaching, event teaching. Duggy the brand should define endless possibilities can come true, for kids worldwide. I see the Duggy Brand as a place a child could go on any screen, live event or location(s), like the Dream Hangar, to be happy.